Using the metric systems for the measuring of industrial bolts as well as metric bolts is becoming increasingly common in industry in the United States. The metric system may also be known as the International System or SI (from the French, Systeme International d’Unites). There is such a wide range of metric bolts and fasteners that it can be complicated to find the right size for an application. They can be purchased individually or according to a specific design and size requirement. Metric fasteners are indicated by the letter M followed by the inner fastener diameter in millimeters (mm), for example, M5 for a bolt that is five millimeters in diameter. Bolts are typically available in both metric and non-metric designations and non-metric bolts and screws are also measured according to diameter but this is labeled in inches and parts of inches rather than millimeters. Some English bolts also use a separate numbering system that increases in size accordingly. Commonly used for both structural and non-structural applications, metric bolts, screws and other fastening components are able to be constructed with full threading or partial threading. Construction, equipment joining and securing, automotive engines on cars, motorcycles and larger machines are all examples of common uses of bolts. Due to the wide range of application and intended use for bolts, there are a number of factors to consider when determining the most suitable style and materials for specific purposes. For heavy load and structural uses such as foundation or bridge securing, anchor bolts are used. If an application requires corrosion resistant materials which are able to be used for even heavy duty purposes, stainless steel bolts are the most suitable choice. Most types of bolts are available in metric sizes, and many bolt manufacturers will stock a comprehensive inventory of metric bolts, nuts and screws in order to be able to meet the wide range of needs in terms of size and capability. 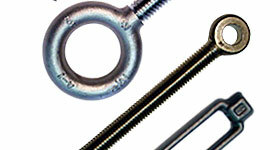 Hex bolts are the standard design for the heads of metric bolts, although this can change based on application. Other typical head designs include flange head types, or the more complex eye bolts or loop bolts. Metric Bolts Metric bolts are bolts that are measured and classified according to the metric system that is used as a worldwide standard for measurement. Metric bolts are an essential component for any product or piece of equipment that must be compatible with parts from other continents such as Europe or Asia.